Here on Red Shutters, I’ve told you about my visit to the Taj Mahal in Agra, India. 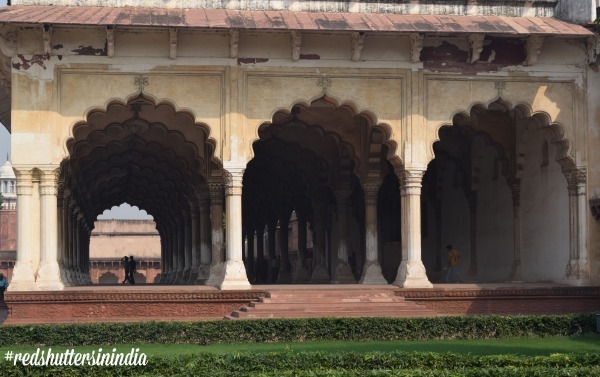 However, I saw more than just the Taj during my trip to Agra and today’s post features two other destinations for travelers in the Agra area: Agra Fort and Fatehpur Sikri. Agra Fort – Located across the Yamuna River from the Taj, the Agra Fort was built between 1565 and 1573 by the third Mughal Emperor Akbar. 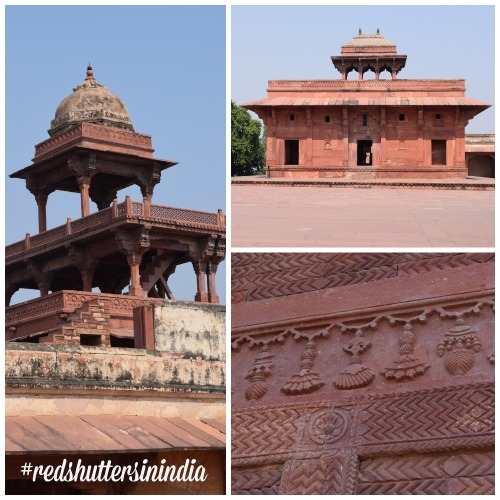 The Fort is an impressive red sandstone complex of elaborate buildings that were altered over the reigns of many different emperors, each putting his on “stamp” on what would commonly be called a palace. On the walk into the Fort, as you approach the enormous doors of the Amar Singh Gate, you can see the remnants of the tile work that had originally decorated the Fort. 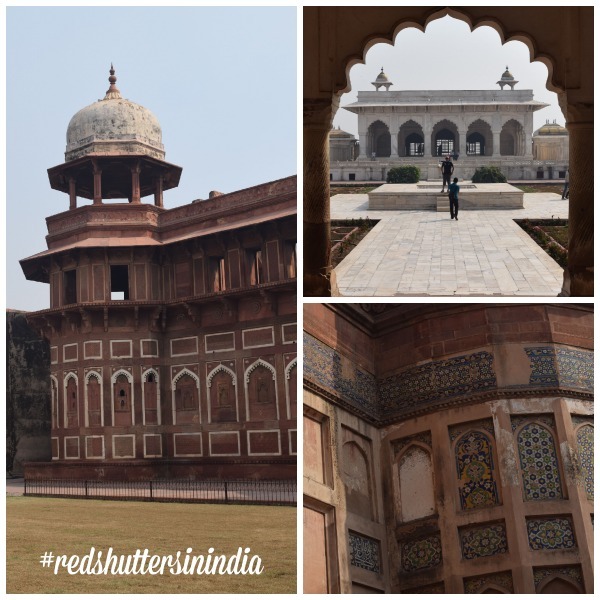 My guide, Mr. Sharma, described what the entrance would have been liked for the emperor in the 1500s: turquoise tiles bright against the sandstone, musicians playing welcoming tunes, women from the emperor’s harem in the windows, and members of the court lining the path. What a contrast to my entrance: I shuffled along through the crowd, past security checkpoints—no music playing for me! The Indian Army occupies some of the Fort today, while several of the buildings are open to the public. Visitors can see Diwan-i-Aam, the public hall where the emperor received guests, with its impressive curved ceiling; an open courtyard where the market was held; and the rooms where the emperor’s harem lived. There’s also a large palace the emperor built for one of his wives after she gave birth to his son (he was very pleased about that, I guess). Interestingly, the Emperor Shah Jahan, the man who built the Taj Mahal, was imprisoned by his son in the Agra Fort for seven years before he died. His imprisonment was part of his son’s campaign to take the throne (it also included murdering his two older brothers, but that’s another story). The Emperor lived in a small set of intricately carved rooms, with a view of the Taj in the distance; I’d like to think that the view helped him remember his wife. I enjoyed seeing the intricate carvings up close, learning how the emperor’s family actually lived in the Fort, and imagining what life would have been like to be a member of the royal court. I’m definitely glad I added this stop to my trip. Fatehpur Sikri – About an hour drive outside of Agra is Fatehpur Sikri, which was built between 1571 and 1585 in honor of Salim Chishti, a Sufi saint. The Mughal capital for 14 years, Fatehpur Sikri is a walled city that features a blend of Hindu and Islamic styles. As you wander through the complex, you see a number of different red sandstone buildings: separate smaller palaces for each of the emperor’s favorite wives (one Hindu, one Muslim, one Christian), each designed to reflect her faith; the emperor’s “office” built to preserve his privacy and safety; the emperor’s bedroom; the harem (always the harem); and the marketplace. I liked the small building that housed the bank most of all; the money was literally built into the walls to keep it from enemies and theft. The Mughals were clever; they typically built different buildings for their summer and winter residences within the same fort or palace. The buildings were designed differently to reflect the seasons: the winter palace had thicker walls to retain heat, keeping the occupants warm, while the summer palaces were cooler, with water running through the walls, to keep the occupants comfortable in the high temperatures and outrageous (my word!) humidity. The Agra Fort and Fatehpur Sikri were great companion stops to the Taj Mahal, but there’s even more to do in the Agra area. If you’re heading to India, consider making a stop here. You can learn more about my trip to India here on Red Shutters and via social media (Twitter and Instagram). 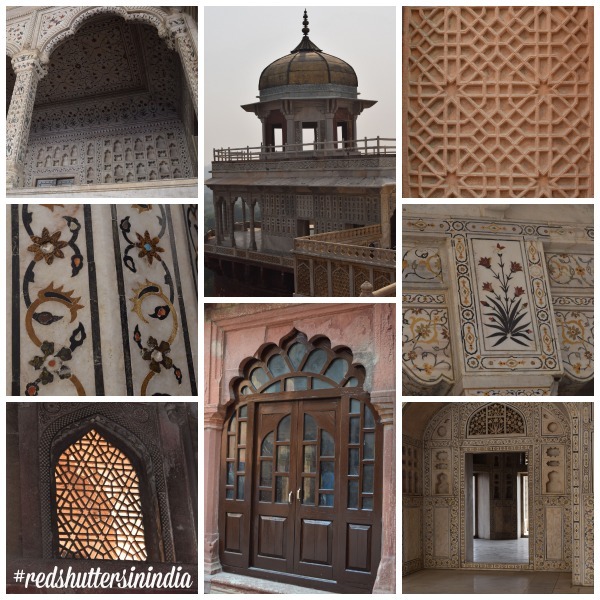 Look for #redshuttersinindia for updates from my trip! Lovely photos of the details! Always excited to read one of your updates from India! 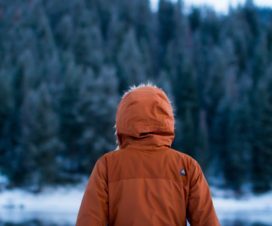 The details are what make the story come alive. Just amazing. This is so beautiful! It always amazes me that there are buildings standing and in such good shape from almost 500 years ago! Amazing to be able to see all of this – it’s amazing to imagine families living in that time period in the forts! Crazy. Great photos and thanks for sharing!